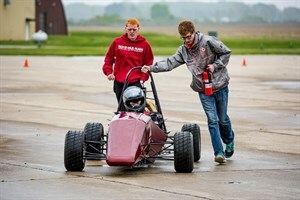 Check out the new Rose-Hulman GPE team car in action! In college, group projects can be a drag. But this year, seniors on Rose-Hulman's Grand Prix Engineering (Rose GPE) team used their love of motorsports to create a capstone design project that resulted in a new and improved race car. Their hard work paid off when Rose GPE earned its best showing in team history at the Formula SAE competition June 15-18 in Lincoln, Nebraska, besting 69 other collegiate teams to finish 2nd in the grueling endurance category, and 7th overall. After many late nights designing new features and turning wrenches in the Branam Innovation Center, the team took its vehicle for some track time at a local airport. The practice runs allowed them to fine-tune and troubleshoot before heading to the first of two competitions they attended this year, in Detroit. Team president and driver Dan Egan is quick to point out that although they've spent more than a year on the new car, the improvement process isn't over. "Design on the Formula cars never really stops," he says. In fact, by the time the team hit the Formula SAE competition at the Michigan International Speedway in mid-May, work had already begun on design changes for next year's car. And when they returned from the Michigan contest, the team took what they learned from the experience and made improvements to the vehicle before heading to Lincoln. Taking a test drive: Christopher Wood (right) and Jacob Lindsey (left) bring the necessary safety precautions, as driver Dan Egan takes the new car for a shakedown run. The senior design team was joined by several underclassmen in building an all-new chassis, improving the fuel system for their one-cylinder engine, and fabricating a carbon fiber body. Though the team's seniors will now move on to careers and grad school, junior Christopher Wood still has one more year. Wood has spent a significant amount of his time over the past three developing the car's aerodynamic features. The experience allowed him to discover that he has a passion for research. "It's really been sort of like an R&D project. Once I actually got to doing [research] I was like, 'Yeah, that's what I want to do'," he says. Many of the team's members are mechanical engineering majors with some mechanical experience, but Egan says that he's a prime example of how someone without much previous wrenching knowledge can participate. When he joined the team four years ago, he had the desire to learn more about automotive design, but little experience. Now, he and others teach and mentor underclassmen. "The team is very proactive about teaching younger members," Egan says. 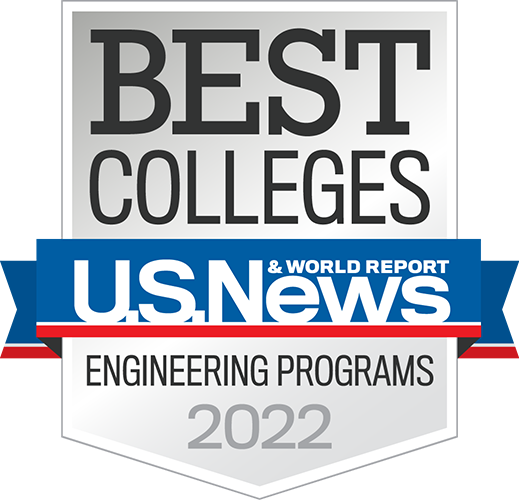 "We recognize that high schools have varying levels of engineering education, and we try to cater down to someone who has none at all."